Amy Marcy Cheney Beach (1867-1944) was a prolific composer of music for piano, voice, orchestra and choir. Her early piano works, those written up to 1894, are presented on the first volume of this set of discs. This CD contains her pieces for piano composed at the end of the 19th century and beginning of the 20th. The first piece on the disc, Variations on Balkan Themes, op. 60, is one of Beach’s seminal works for piano. Written in 1904, it is a substantial piece based on folk melodies that were introduced to Beach by the Reverend William Washburn Sleeper and his wife, missionaries to Bulgaria. At a talk which Beach organised, Rev. Sleeper played some folk melodies that the couple had collected in their travels. Beach transcribed four of the melodies from memory several days after the presentation and used them as the basis for Variations, which she took just over a week to write. Over whose fresh grave moanest thou so? Beach restates the last line again, ‘Over whose fresh grave moanest thou so?’ painting an especially bleak picture of utter melancholy. Beach continues in C# minor for the first three variations. Variation I is a canon, with the left-hand following the right-hand entry in imitation; the second variation is a grand expansion of the theme, marked maestoso and with three beats to the bar; and the third variation is a light allegro in duple meter. For the next variation, Beach moves into B-flat minor. Variation IV is a barcarolle, beautifully set in binary form with parallel thirds and sixths supporting the melody over a simple left-hand accompaniment. The fifth variation, in G-flat major, begins with the left-hand alone. In the tenth bar the right-hand enters with decorative trills. The next phrase, now in E-flat minor, is again for left-hand alone, with the right-hand joining in after eight bars in a descant trill. Variation VI opens in F# minor with a statement of another Balkan melody, ‘Stara Planina’ (‘Old Mountain;’ Stara Planina is the mountain range which divides northern and southern Bulgaria). This acts as an introduction, ‘quasi fantasia,’ to the actual variation on ‘O Maiko moyá’ which is marked Allegro all’ ‘Ongarese (in a Hungarian style). As the sixth variation continues, Beach moves to F# major and utilises a new melody, ‘Nasadil e dado’ (‘Grandpa has planted a little garden’). This tune is taken into A major before returning to F# minor to conclude the variation. Beach returns to ‘O Maiko moyá’ for variation seven, a slow waltz in E major. Variation VIII is a funeral march. There is a long introduction to the march based on the folk melody ‘Macedonian!’ a mountain cry for help. The working out of ‘Macedonian’ provides a desolate backdrop for the entry of a low trill, the rumble of which undergirds the funeral march. ‘O Maiko moyá,’ is stated simply in E minor, becoming grander and more tragic as the variation develops. The dotted rhythms of the march, coupled with full chords and tremolo in both hands, make the funeral procession a momentous occasion that builds to a climax before unraveling down to low trills in the bass of the piano, ending as it began. An extensive cadenza follows, heralded by a quiet reflection on ‘Stara Planina.’ Lovely arpeggios and passages in thirds ensue, leading to a section alluding to the maestoso of Variation II. Octaves and massive chords usher in a grand presentation of ‘Stara Planina,’ which then winds its way down to a beautiful, still restatement of ‘Macedonian!’ The opening theme returns, with Beach diverging from the original at the end of the third phrase, moving seamlessly into C# major for the final cadence. Beach wrote an orchestral version of the Variations in 1906, including an extra variation. She revised the piano score of the Variations in 1936, taking out repeats, transposing the funeral march and final statement into E-flat minor and shortening the coda. Beach arranged the work for two pianos in 1937, using the 1936 version and including two extra variations. This disc contains the original solo version of 1904. Children’s Album, op. 36, was written in 1897, the year after the premiere of Beach’s Symphony in E minor, “Gaelic,” op. 32 and the composition of Sonata in A minor for Piano and Violin, op. 34, and the year before she began work on the four-movement virtuosic Concerto for Piano and Orchestra in C# minor, op. 45 (1899). Beach’s reputation was at a high: she was known nationally and respected by other important composers (John Knowles Paine, George Chadwick and Arthur Foote). Children’s Album is a suite of pieces in classic musical forms. It opens with Minuet, a charming composition in three parts. The first section is in rounded binary form, followed by a trio and then the return of the opening section. The next movement, Gavotte, harks back to the French court dance of the same name. In Waltz, Beach sets a long melody over a traditional waltz pattern in the left-hand for this gentle reminiscence in ABA form. The fourth movement, March, is a sprightly dance of dotted rhythms with the odd three-bar phrase thrown in to set the marchers off-kilter. A lively Polka ends Children’s Album. Marked scherzando, a sense of fun pervades as the phrases bubble one after the other. The Serenade of 1902 is based on Richard Strauss’ song Ständchen, op. 17, no. 2. Beach’s handling of Strauss’ material transforms the original work in a very compelling transcription for piano. Beach keeps the piece in the same key, F-sharp major, and uses similar figuration to Strauss throughout in imitation of the brook and rustle of leaves which form a backdrop to the love song. She cleverly incorporates the sung line in amongst the flurry of accompaniment, beautifully rendering Strauss’ setting of the words by 19th-cenutry German poet Adolf Friedrich von Schack. The opening stanza is in the same register as Strauss’ original, the next verse is set down an octave by Beach, with occasional forays into the upper register of the piano to end vocal phrases. In the next section, when Strauss moves into D major, Beach begins with the melody in octaves in the bass of the piano to take the listener into ‘the twilight mysterious under the lime trees.’ The piece is mostly faithful to the original score except at the climax, where Beach expands the material in a most effective way. She includes some extra bars of arpeggiation and doubles the duration of the vocal pitches, as well as adding more of a pianistic flourish at the end. The two pieces of op. 54 were written in 1903. This disc is evidence to Beach’s interest in folk music: firstly the Balkan melodies of the Variations; now the influence of Celtic music in Scottish Legend; and then the Alaskan Inuit tunes of Eskimos. Scottish Legend begins in D minor with a rising melody gently ornamented as it evolves. The solemnity of the first section is juxtaposed with the slightly more animated middle section, in D major. Beach returns to the tonic minor with a truncated restatement of the opening material. Gavotte fantastique is based on the second piece of Children’s Album, op. 36. As the title suggests, Beach uses the simple gavotte as a springboard for a more technical showpiece. Trills and octaves build on the template already established to make this a fantastical tour-de-force. The next set, Eskimos, op. 64, was published in 1907. The four pieces are based on Inuit themes Beach found in a discourse by Franz Boas (1858-1942, anthropologist). Beach sets these traditionally unaccompanied melodies in a straightforward way, keeping the flavour of the folk tunes. Arctic Night opens starkly, with the melody first in unison between the hands and then supported with lush harmonies. The sprightly energy of The Returning Hunter comes in contrast, again beginning simply with the Inuit melody before being harmonised. Beach later uses The Returning Hunter as the basis for the Scherzo section of the second movement of her Trio for Piano Violin and Violincello, op. 150 (1938). In Exiles, headed lento con amore, Beach sets the folk tune ‘The Fox and the Woman,’ published by Boas in The Central Eskimo (Smithsonian Institute, 1884-1885). After a four-bar introduction, With Dog-teams races ahead in a lively presto, a brilliant picture of huskies skimming across a snowy landscape. Moderato is an undated manuscript held at the University of Missouri-Kansas City Miller Nicholls Library. A single bar at the bottom of the first page is lost due to a torn corner, but the pianist on this recording has continued the harmonic progression to give a complete performance. The mood Beach creates with Moderato is magical. The static writing and shifts of colour show a master with utmost restraint creating a miniature gem. 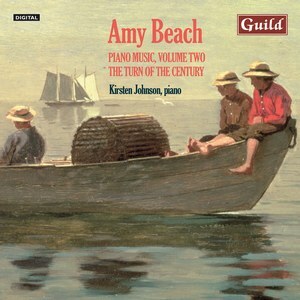 Amy Beach, the most illustrious female composer to emerge from the USA, was a child prodigy from New Hampshire. Reportedly, at the age of one she was able to memorize 40 melodies and was competently writing waltzes by the age of four. She was largely self-taught and her compositions include a good deal of piano music alongside larger-scale orchestral and choral works. She was an active educationalist who toured extensively in Europe as well as America and was a fervent exponent of Classical and Romantic repertoire as well as her own piano works. Kirsten Johnson comments in the booklet notes that the Variations on Balkan Themes of 1904 came in response to a collection of folk melodies brought back from missionaries to Bulgaria. Beach’s prodigious capacities allowed her to score not only four of these from memory but to complete the entire work – which lasts close to half an hour – in little more than a week. She successfully encapsulated the melodies from which the variations are constructed within a highly accessible and tonal language that frequently draws sustenance from figurations owing much to Chopin and Liszt. Yet the music amounts to more than mere parody, for Beach is often capable of revealing a fresh and personal voice: poetic, stirring, virtuosic and highly chromatic. The Variations are superbly executed by Johnson, the pianist controlling the climactic flourishes so as to retain a focus on the all-important melodic thread. This is sensitive playing, the seventh variation (‘ Quasi Fantasia’) enlivened by a delightfully crisp attack and the ‘Marcia funerale’ given a dark, brooding resonance. Before the reprise of the main theme there is a ‘Cadenza’, which holds more than a passing allusion to the extravagant pianistic exploits of Tchaikovsky and Liszt. I enjoyed the five-movement Children’s Album, a setting of dances ranging from the minuet to the polka, which (surprisingly uncommonly for pieces bearing such a description) can work nicely in a child’s hands. The Serenade, a transcription of Richard Strauss’s song Standchen, turns out to be an exceptionally faithful rendering of the original, the climax none the less acquiring a new and expansive treatment. This is a really effective work, made all the more sparkling by Johnson’ s lightness of touch. Beach’s fascination for folk melodies continues in the ‘Scottish Legend’, Op. 54 No. 1, a charmingly wistful little piece that raises a smile (there again, I’m no more Scottish than Beach). The ‘Gavotte fantastique’, Op. 54 No. 2 has shades of Rachmaninov, while the work she called Eskimos brings together several Inuit melodies. This is a delightful collection, full of naive character and interest, especially ‘The Returning Hunter’ and ‘With Dog-Teams’, beautifully rendered by Johnson. There is much to enjoy in this album, although one is left with the feeling that while much of the material is rather good, it frequently falls somewhat short of ‘great’. Beach’s mastery of the instrument is abundantly clear, however, the more florid writing demonstrating her own extraordinary facility, and the voicing of the more lavishly constructed chords finely judged. Amy Marcy Cheney Beach only swam into my ken recently, and I’m so glad she did. Like her compatriot and contemporary Charles Edward Ives she hailed from New England, where she made quite an impact as a child prodigy. She gave her first public performance at seven and, largely self-taught, went on to become both a performer and a composer of some distinction. Unfortunately for such an independent-minded and talented young woman her husband insisted she limit her performances to just one a year; the good news is that she was then able to devote more time to composition, becoming America’s first female composer of large-scale orchestral works, such as the Symphony No. 2 in E minor ‘Gaelic’ (1896) (on Naxos, Bridge and Chandos). Given that she was a piano prodigy it’s hardly surprising that much of Beach’s output was written for the instrument. Inexplicably, recordings of her works are still few and far between, so Guild must be congratulated for taking on this series with American-born pianist Kirsten Johnson. My colleague Jonathan Woolf welcomed the first volume of early works – see review – and now we have the second, covering the period 1897-1907. The first piece, Op. 60, is based on Balkan folk melodies Beach picked up from two missionaries to Bulgaria. An unusual source of inspiration, perhaps, but these tunes form the basis of a most rewarding set of variations. The opening Adagio malincolico is surely Chopinesque, but surely there’s a hint of something much more individual in the music’s harmonic shifts and twists. Johnson, who has an interest in music from this part of the world – she has recorded two discs of Albanian music for Guild – see review 1 and review 2 – also provides very informative liner-notes. As I’ve said before, informed comments and analyses are most useful when it comes to less familiar repertoire; if only all recording companies took the same view. As for the pieces in Op. 60 – ranging from a minute to four-and-a-half in length – they cover a wide variety of moods. Variation II is particularly forthright, masculine even, in its weight and reach. Contrast that with the finely wrought Variation IV and you’ll soon appreciate the cut of this composer’s jib. St George’s, Bristol, makes a fine venue for this recording; the piano sounds warm and detailed throughout, with no hint of distracting brightness or jangle. But what I admire most is Johnson’s natural, flowing style, which picks up so much colour and detail along the way. Those simple arpeggios and trills in Variation V are finely graded yet so full of feeling. If you’re looking for rough Bartókian rusticity in these tunes you’re in the wrong place. It seems that Beach merely uses these melodies as springboards for a series of highly expressive inventions. The repeated rhythms and whirls of the Allegro all’ Ongroise and the Marcia funerale may seem a little understated but Johnson handles this music with wonderful poise and restraint. They are miniatures, after all, and I’m delighted that she isn’t tempted to put them in large, ornate frames. Variation VII is one of the loveliest pieces here, combining weight and delicacy with a certain rhapsodic quality. Even in the broader, more declamatory moments – Variation VIII for instance – Johnson’s sense of musical perspective ensures these pieces are scaled to perfection. The sombre Funeral March has a measured tread, the pianist very much in control of the music’s steady climb to a dynamic peak and its gentle descent to the valley below. Similarly, in the Cadenza Johnson finds a good balance between the music’s outward virtuosity and its inner voices. Just listen to the bell-like close to this section and the gentle but expansive reprise of the opening theme. This really is delectable music, superbly played. In the great tradition of children’s pieces – Schumann and Debussy spring to mind – Beach’s Children’s Corner artfully combines an element of grown-up gravitas with child-like charm. Witness the earnest little Minuet, with its fleeting glimpses of something more wistful; Johnson phrasing the Gavotte with grace and a real feeling for the music’s delicate proportions. Ditto the music-box-like-tinkle of the Waltz, whose gentle rhythms are so naturally done. A March and Polka round off the suite, the latter combining crisp inner detail with plenty of outward sparkle. Beach’s transcription of the Richard Strauss song Ständchen is sensitively done, the flourishes capturing the swirl of the orchestral original, Johnson conveying the music’s surging character as well. Very accomplished writing indeed, played with orchestral amplitude. Scottish Legend is more considered, yet it retains all the ease and fluency of Beach’s earlier pieces. As for the Gavotte fantastique it fuses pointillist dabs with broader swathes of colour, yet it sounds wonderfully nimble in Johnson’s hands. The more programmatic Eskimos – based on Inuit melodies – is sparer of texture but no less atmospheric for that. The plain harmonies of Arctic Night give the piece a somewhat desolate feel; The Returning Hunter is much brighter and more rhythmic and Exiles has a restless, yearning air to it. As with much we’ve heard thus far there is an economy of style in Eskimos, an emotional restraint, that is most impressive. It’s the kind of writing that can so easily underwhelm unless it’s played with utter conviction. No quibbles on that score, with Johnson despatching the animated final section with her customary elan. The disc ends with an exquisitely shaped little Moderato, the perfect sign-off to an enchanting collection. Like Cortez gazing down from that peak in Darien new listeners will surely marvel at the more compact, but no less revelatory, landscape unveiled here. Any niggles or no-nos? Absolutely none. This is heart-warming music played with rare grace and character; indeed, it could very well be one of my discs of the year.